FMF - Friends of Minerals Forum, discussion and message board :: View topic - Endomorph or Pseudomorph? Posted: Aug 13, 2008 10:29 Post subject: Endomorph or Pseudomorph? Prof. Nancy Millard had a clear cut view on Endomorph and Pseudomorph. She claimed pseudomorph was often the incorrect description whereas it should be endormorph. Opinions? Posted: Aug 13, 2008 11:22 Post subject: Re: Endomorph or Pseudomorph? ...There are three types of pseudomorphism, depending on the nature of the transformation: alteration, incrustation, and replacement. " A special type of alteration pseudomorphism, known as paramorphism, occurs when the chemistry remains exactly the same and only the structure of the original mineral is changed. Minerals of differing crystal structures but of the same composition are called polymorphs. 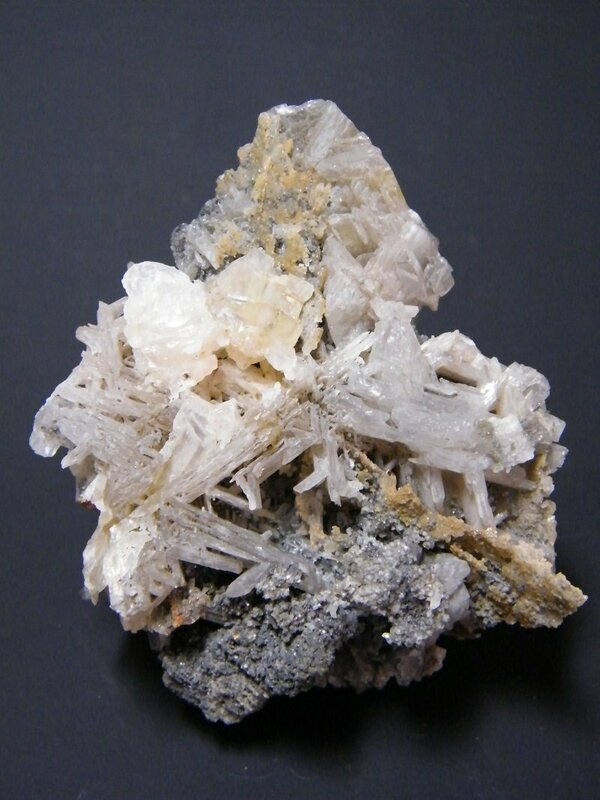 A paramorph then, is a crystal of one polymorph that has changed into another polymorph without changing its outer form (e.g.acanthite after argentite, aragonite after calcite, and rutile after brookite). Incrustation pseudomorphs, or epimorphs, have a hollow, shell-like appearance and occur when a later mineral has formed a crust or coating on an earlier-formed mineral, such that the form of the latter is still recognizable and where the latter was naturally dissolved away. Epimorphs have also been known as casts but this term can be somewhat confusing because a “cast” can either be the impression of one mineral in another or a mineral formed in such a “mold”. Replacement pseudomorphs involve the replacement of one material by a chemically unrelated mineral (e.g. copper after aragonite from Bolivia, cassiterite after orthoclase crystals of Cornwall). Fossilized specimens such as petrified wood, where quartz has replaced the original wood fibers, have also been classified as replacement pseudomorphs even though the original material was not a mineral. Another type of replacement pseudomorph is the result of a later mineral infilling voids left by some earlier mineral or object, since removed. These are also confusingly referred to as casts, and in this case simply calling them replacement pseudomorphs is sufficient and not ambiguous with respect to epimorphs. One example of pseudomorphs of this kind occur when tree trunks or limbs, enveloped by hot lava and completely destroyed by burning, leave cavities, which are later lined or filled by opal or quartz. In such cases the internal structure of the wood is not preserved. In other instances, soluble crystals coated with a more stable mineral dissolve from within, leaving cavities that faithfully mirror their form. These voids are later filled with another mineral producing the pseudomorphs." Anyway, hope this is of help and comments are welcome. Posted: Aug 13, 2008 12:42 Post subject: Re: Endomorph or Pseudomorph? I'll take a stab too, at comments about "Endomorphism". Your query about this took me by surprise, because it was not a term I was scarcely familiar with at all---hmm, is that really a category of pseudomorphism? It's definitely one of the least-used such terms. Usually, the arguments about "what's a pseudomorph, or not" come about in relation to epimorphs--how much of a "coating" is required to consider something a pseudomorph (that's kind of a semantic question), and is a simple encrustation--mineral Y growing around mineral X--necessarily really a pseudomorph, if it is not particularly preserving the original form, just using it as a base to grow a crust of new crystals. "A mineral which incloses another has been called a Perimorph; one inclosed within another, an Endomorph." 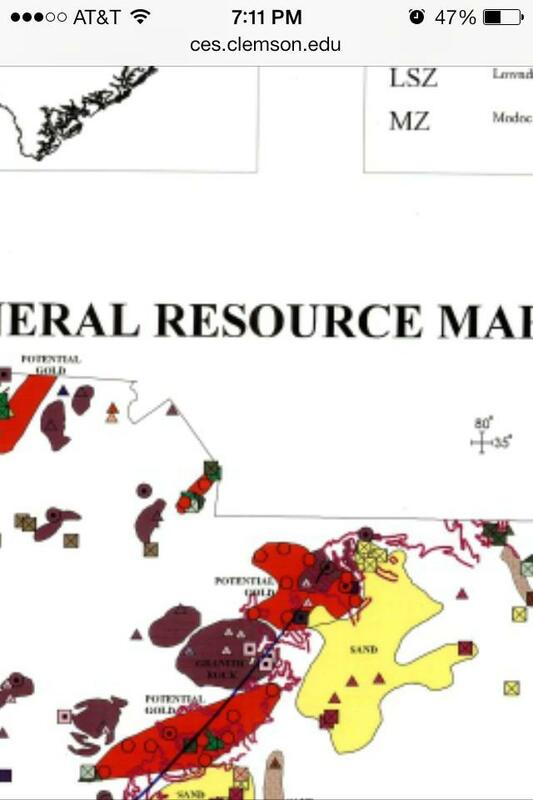 "Most of the minerals [in the alunite-jarosite group] can be defined as solid solutions involving end-member species hidalgoite, hinsdalite, plumbogummite, beudantite, and corkite. They occur as massive aggregates, pseudomorphs or endomorphs after pyromorphite or mimetite and as drusy crusts, single crystals, or groups of attractive, well-formed crystals." "Many crystals have cores of beudantite." So, with rather little to go on, I won't presume to try to write a definition of just what is or isn't an endomorph, other than that it relates to one mineral surrounding another--perhaps, the presumption is that this is via simple mineral growth, in contrast to alteration. Gail, I think a good thing to do would be to write to Nancy Millard, and ask her for some comments and a definition of exactly how she thinks the term should be applied! P.S., Mark, I meant to add, the squarish-cross-section pseudomorphs of fine-grained pink lithium mica from the Harding mine, NM, are believed to be pseudomorphs of lepidolite after topaz. There's not much tourmaline at the Harding mine, except acicular black schorl in the contact zone. First, what is the basis of the prof.'s argument? Second, I agree with Mark that "pseudomorph" should be used as a blanket term. Linguistically, it doesn't make complete sense: if "pseudomorph" means "false form" (one mineral has taken on the shape/composition of another) and "epimorph" means "outer form" (one mineral takes the outer form/composition of another, i.e. forms a cast), then does "endomorph" ("inner form") mean that one mineral takes the "inner form/composition" of another? I suppose it comes down to whether you're thinking of "form" at the visual level or at the molecular, and I think that for many/most people "pseudomorph" is a visual-scale concept. Too confusing and splitting hairs for me. I have a specimen (previously posted) of quartz encapsulating fluorite while retaining the geometry of the fluorite. Is this specimen quartz epimorphing fluorite, fluorite endomorphed by quartz, or a pseudomorph of quartz after fluorite? (I don't actually know what's inside so I can't tell you, but it makes the point). I advocate keeping it simple and referring to it as a pseudo. By the way, Mark, a Google search on algebra tells me that "endormorphism" is a matemathical concept, used in abstract algebra, not a physiological term - I don't see how it would apply to a body type unless you mean transgenderism. Tracy, I agree with your simple suggestion: yes, keep it simple and for most purposes just call things "pseudomorphs", and don't belabor too much about which subtype they are. And also (mixing up responses between threads, I guess), thanks for your comments & perspective on the East Coast Show, too. Hey, if I want to say more I should post it on THAT Forum topic, which I will! Thanks for the bit on the Harding occurrence...always puzzled me. Endomorph, mesomorph, and ectomorph are somatotypes (a classification of human/animal body types); endomorphs are what some call "big boned"...large frame, propensity to put on pounds. The terms did not originate with him, but I came across them in reading Gurdjieff's books. Thanks for clarifying on both fronts, Mark. My background is toxicology, and I had not heard of these somatotypes before. And the types of pseudomorphs are neatly summarized. My comments were directed more at the linguistics and less on the disciplines in which these terms are applied. I have just sent off an email to Nancy, I have asked her to elaborate on what she talked about at her lecture. I was quite surprised that there was a distinction as I haven't seen the word endomorph on any of my specimen labels, but I have seen pseudomorph readily used. Will let you know as soon as Nancy replies. John White wrote a very interesting column in Rock & Minerals magazine about this topic. I'm not totally sure but I think that in the issue of Sep/Oct 2003 and named “Using the proper '-morph,'”. Probably he will participate on this discussion when he be back. I have been on vacation so was unable to enter the endomorph or pseudomorph discussion. 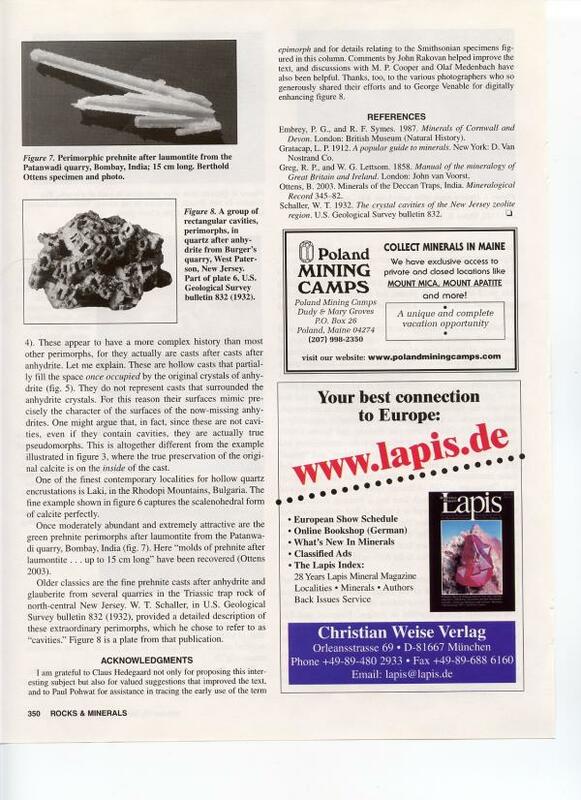 Now that I am back I would like to reference my column on this subject which appeared in Rocks & Minerals magazine, ( https://www.rocksandminerals.org/ ) the Sept./Oct. 2003 issue, as Jordi stated. I hope that the discussion reproduced here will help to clear up some of the confusion which unfortunately surrounds this fascinating aspect of mineral collecting. Perhaps it is time that we collectors (1.) made an effort to really, really understand the terms that we are using in this context, and (2.) insist that dealers and museums use the proper terminology on their specimen labels, at least insofar as we can agree on what these related terms actually mean. 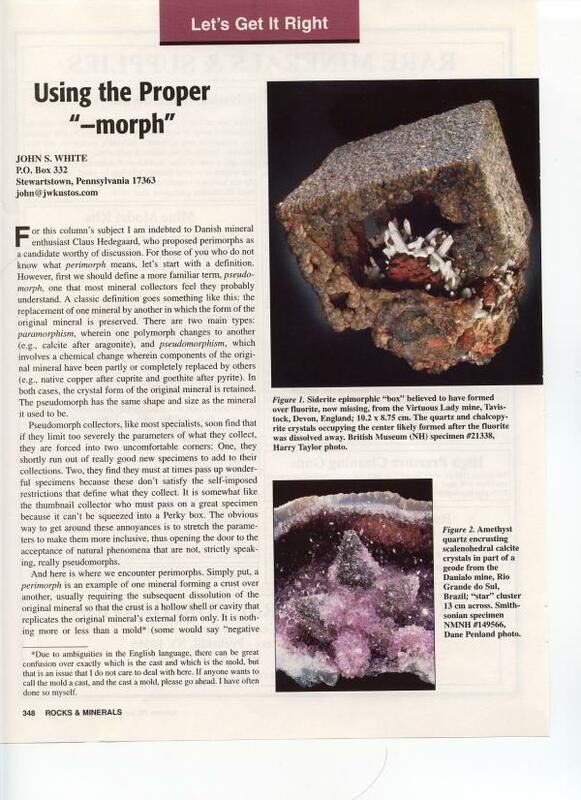 Here is the column about Using the proper -morph, published in the magazine Rock & Minerals, the Sept./Oct. 2003 issue. Thanks to Marie Huizing for permission to reproduce this column. Just curious (and a bit confused)... Are there many pseudomorphs that have their own name? Example: Martite. "Martite is the name given for Hematite pseudomorphs after Magnetite crystals." Or is martite a variety of hematite? "Hematite var. Martite". Thank you, John (and Jordi), for reminding us about John's article (I was about to suggest a "Let's get it right" article on this subject...and perhaps a more thorough one is still warranted). 1) I had totally forgotten about "perimorph"...I have always used "epimorph". 2) I misunderstood the definition, as I read it in the Glossary of Geology, of endomorph...it relates to the substrate as opposed to the incrusting (encrusting...I have not yet figured out which of these two is more prevalent either) mineral. I had that backwards, and my apologies to the readers/participants of this thread. It is interesting that the American Heritage Dictionary uses the example of rutilated quartz as an example of mineralogical endomorphism. That, of course, takes us right out of the pseudomorph arena. There are others but I don't have an exhaustive list. Two that come to mind immediately are achtaragdite, which is a hydro-garnet after ? ?, and xanthitane, which is an earthy anatase after titanite (sphene). I am sure there are at least several more. To KDF-TX: just add that effectively "Martite is the name given for Hematite pseudomorphs after Magnetite crystals." The label read "Hematite var. Martite", but it is a pseudomorph, not a var.? So it's not like amethyst is a variety of quartz? 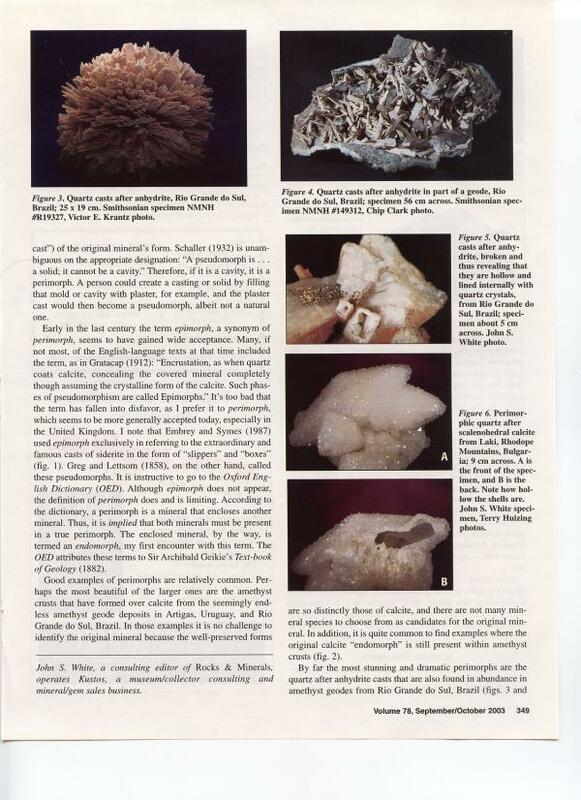 "They [the alunite-jarosite minerals at Broken Hill] occur as massive aggregates, pseudomorphs or endomorphs after pyromorphite or mimetite and as drusy crusts, single crystals, or groups of attractive, well-formed crystals." With all apologies to Birch et al. who wrote that paper, given that we are defining endomorph as "...a perimorph is a mineral that encloses another mineral. The enclosed mineral... is defined as an endomorph." With that in mind, how does one interpret the lines above; "endomorph after pyromorphite or mimetite"? Beats me... it sounds like, the term has just not always been used very clearly. If something is inside, it isn't really "after" anything. Martite is not a variety name as it is a pseudomorph of two mineral species (not varieties): Magnetite and Hematite, so Martite is just a name used for that particular kind of pseudomorph. "Variety" is a term commonly applied to minerals with slight differences with their related mineral species, and as far as I know, is not used for pseudomorphs. I am not sure that I totally understand what Pete is trying to say, but it appears to me that there are at least two different possible types of true pseudomorphs. In one case only part of the original mineral has been replaced, as in goethite after pyrite. The iron in the pyrite was not removed, while the sulfur was replaced by oxygen and hydrogen. I can envision another type of pseudomorph in which all of the mineral was removed leaving a cavity shaped like a crystal of the original mineral. If this cavity was subsequently filled by an entirely different mineral having no components from the original crystal, it should still be considered a pseudomorph, in my opinion, because it satisfies the classic definition of a pseudomorph. As far as I know a true pseudomorph does not have to retain some of the chemistry of the original mineral.
" I can envision another type of pseudomorph in which all of the mineral was removed leaving a cavity shaped like a crystal of the original mineral. If this cavity was subsequently filled by an entirely different mineral having no components from the original crystal, it should still be considered a pseudomorph, in my opinion, because it satisfies the classic definition of a pseudomorph. " that this would be a pseudomorph, and if existing inside an outer, enclosing mineral, I presume this would be considered an example of an "endomorph". But all I meant when I wrote was, that if one had an original crystal, say mimetite, that became surrounded and enclosed by new mineral growth by a second mineral, say, jarosite, one might consider this to be a pseudomorph, and to further, be an example of an endomorph-perimorph pair; but I don't think one would describe the mimetite as "an endomorph AFTER anything", because it doesn't exhibit any crystal form but its own. This business all starts to give me a headache when I try to analyze it too carefully. Can we just go back to referring to all as "pseudomorphs", and leave it at that?